I finally got the time to read Maus today. 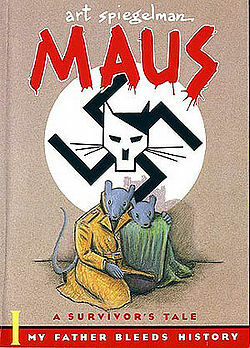 So here is my review of Maus: The Honeymoon. Normally I don’t enjoy flashback/flash forward but for some odd reason I really enjoy the ones Spiegelman uses. I feel they give Vladek more character than he would have had with just a beginning “now” and then flashing back for the rest of the story. Plot-that-isn’t-really-a-plot-since-it-is-history still intrigues me. Even though I’m only two chapters in, I want to know more (especially about Anja’s supposed Communist loyalties and her family). The moments on the train felt very poignant seeing as I know what comes after. And how cute was Anja and Vladek at the dance!? Those panels made me smile. I really enjoyed the little family moments that were thrown in as well. I think those moments make Maus that much more realistic. I feel like the art has gotten better, even though it was beautiful in the first chapter. I enjoyed the more detailed background Spiegelman did and there didn’t seem to be as many of the lines that I mentioned were in the first chapter. I noticed some, but they were nicely integrated into the backgrounds. I’m still enjoying Maus, but I feel that I am waiting for something but I’m not sure what. That’s going to bother me greatly.